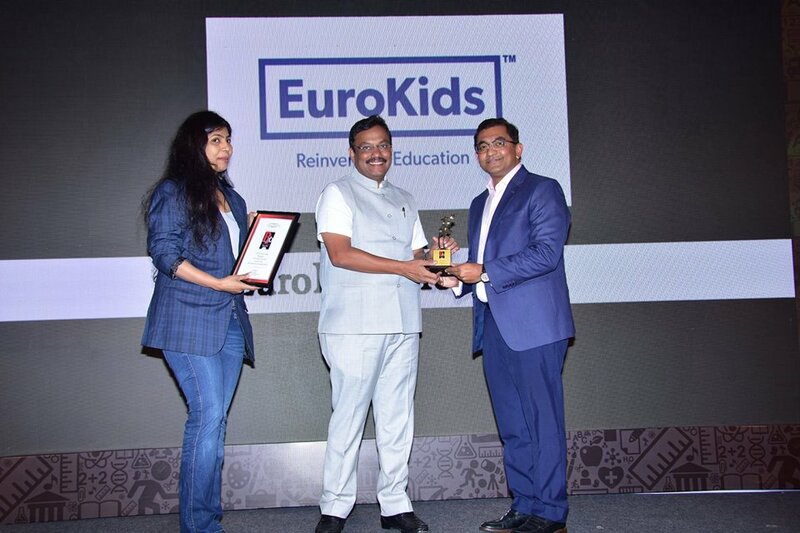 Mumbai: EuroKids International, India’s leading pre-school network was awarded as the ‘Best Education Brand of 2018: Pre-School & Nursery Category, at the 2nd edition of the ET Best Education Brands Award ceremony held on Saturday March 24th 2018, by The Economic Times at The Taj Vivanta, Mumbai. Honorable Minister of Education, State of Maharashtra, Mr. Vinod Tawde, who was the guest of honour at the event, presented the award to Mr. Prajodh Rajan, Co-founder & Group CEO, EuroKids International. Receiving the award, Mr. Prajodh Rajan, said, “We are delighted to receive the award, which recognises our initiatives towards providing the highest quality of pre-school education. All our efforts are directed keeping in mind our ‘Child First’ ideology which is at the core of our pedagogy, ensuring that a child’s development, safety and engagement needs are met in a home like environment, as we make learning fun for young children at our pre-schools”. He further added, “The learnings at our preschools have been refined periodically, to keep the pre-school curriculum contemporary and balanced. In a digital age, we ensure our curriculum gives the best of both worlds to the child, by striking a balance between tech-enabled learnings and conventional educator driven pre-school engagements”. The event also featured a panel discussion where Mr. Prajodh Rajan shared his views on the changing trends in the education industry, usage of technology in the domain, and game-changers to look towards. He also spoke of the positive impact of new age learning curriculum, unconventional course content, and helping educators be prepared for the dynamics of a rapidly changing environment. The award is one more addition to the recognition that EuroKids has received from the industry, testament to the years of expertise put in by its team towards shaping young children for the journey ahead.